User data storage has been made easy with the new storage objects (sessionStorage and localStorage) made available in HTML5. In this article we will see how to work with it. With HTML5, data can be stored in the user’s browser. Earlier it was done using cookies. With HTML5 DOM the following objects can be used to store data. All storage is done using key-value pairs. This article explains how to store data using the above objects. The storage objects are supported by all latest browsers. Note that I have used Opera to test the code listings and provide the images. Session storage allows users to store the data for a single session. As soon as user leaves the page and closes the browser window the data is lost. This can be used for interactive games where a temporary storage is required to store data. 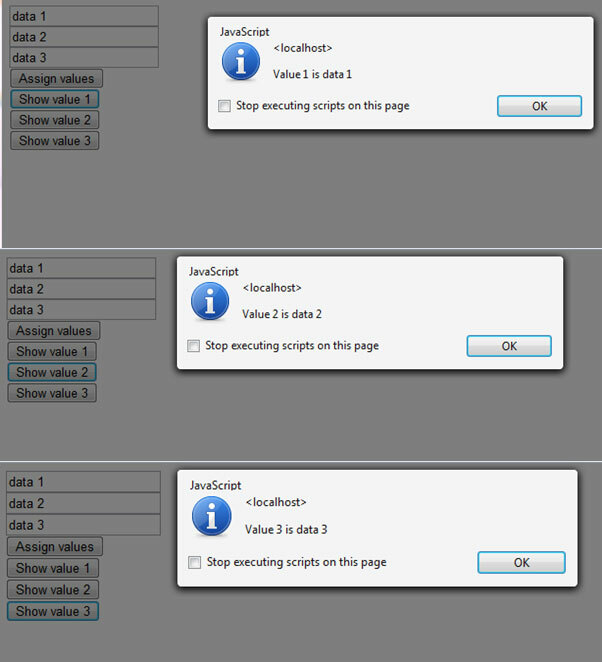 The keyName has to be a string value while the value can be any acceptable data type. The key-value pair is always stored as string values. So always remember to convert the value to the correct data type before using it. Here is an example of how to use session storage. There are four functions in use in the above listing. The AssignValues function is used to set the key-value pairs. The text from the first textbox is assigned to a key text1, text from second textbox is assigned to key text2 and the text from the third textbox is assigned to the key text3. The Value1 function retrieves the key text1. The Value2 function retrieves the key text2. The Value3 function retrieves the key text3. The functions are called upon the onClick event of the various buttons. Note that if you click the first button without any textbox values, an empty value is alerted as the value. Also the data is lost as soon as the browser is closed. Cookies are included with every server request while local storage is transmitted only upon request. This means that we can store large amounts of data without affecting the website performance. Local storage values can be set and retrieved in the same fashion as session storage. The above listing contains similar functions as listing 2 except that it uses local storage object. The ShowLength function is used to retrieve the number of items in the local storage using the length property of the localStorage object. 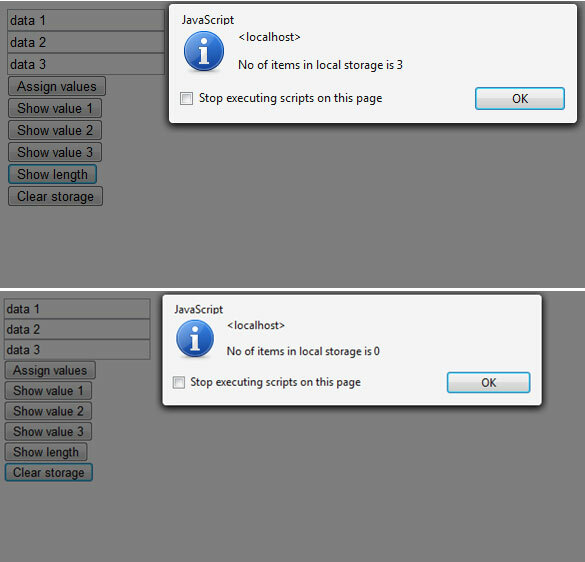 The local storage is cleared using the clear() function of the local storage object.